Classes began this week at California’s newest medical school. UC Riverside is the first publicly-funded medical school to open in the state in more than 40 years. Fifty students make up the school’s inaugural class. Last Friday night, the audience gave the medical students a warm reception as they filed into the school's main gymnasium. After some introductory remarks, the crowd fell silent as the young men and women lined up at the foot of the stage. “I would like to welcome our first student across the stage, Omar Aldas,” the speaker announced. Riverside County had 99 doctors per 100,000 people, versus a statewide average of 174. 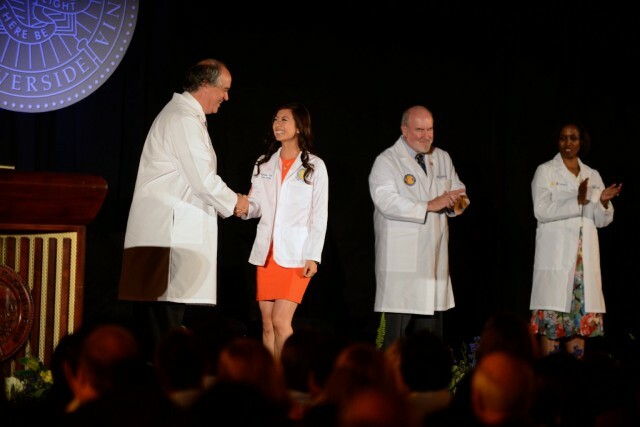 One by one, students came up and were ceremoniously awarded their physician’s white coat. While some students were visibly nervous as they walked onto the stage. 23-year-old Michelle Tom sported an enormous smile. She was still beaming when the ceremony was over. Standing off to the side, Jose Medina was smiling, too. Medina represents Riverside in the California Assembly. He wrote the bill that secured $15 million in annual state funding for the new medical school. It got unanimous support in Sacramento. Medina said California’s Inland Empire has an acute shortage of doctors. A 2009 report from the California HealthCare Foundation found that Riverside County had 99 doctors per 100,000 people, versus a statewide average of 174 doctors per 100,000 people. UC Riverside officials say that’s their goal: to attract students who want to serve the region in the areas of greatest medical need. Those include primary care, gynecology, and psychiatry. The school’s dean, G. Richard Olds, explained the school also wants to focus on matters that get short shrift in other programs, especially wellness and prevention. "We’re adding to the curriculum what I think doctors in the future are going to have to be much better at, which is keeping you healthy,” Olds said. Indeed, that message was hammered into students in their very first lecture this week. “Prevention is a must,” one of the lecturers told the students. “We simply cannot afford current rates of morbidity and mortality. We can’t. And so our issue is, how do we, as physicians ... motivate people" to live healthier lifestyles, he asked the class. Olds said aspiring doctors certainly need to master the science of modern medicine. But he argued there’s a lot more to being a doctor than academic achievement. That approach struck a chord with medical student Isaiah Roggow. The UC Davis graduate had his pick of medical schools. Roggow chose UC Riverside because of the special feeling he got from the faculty. Dr. Arnold Tabuenca chairs the department of surgery at the new school and says he’s looking forward to teaching the next generation of doctors. “When you experience and see somebody that really has a complete lack of knowledge, and then they go through medical school and they go through training, to the point that you say, 'Well, you could be my physician,' it’s completely fulfilling,” the surgeon said. In the hopes of generating more doctors for the region, UC Riverside officials plan to expand enrollment in the near future.